Facebook continues to provide marketers with the tools they need to be successful. With the addition of Facebook Analytics, they're closing the gap on measuring actions taken in the News Feed to what happens on company websites, apps, and brick and mortar stores. They're tying all these channels together to provide marketers with an omni-channel measurement and analytics tool. And it's awesome! Yet, the adoption rate of Facebook Analytics among marketers appears to be low (at least amongst my circle of paid social friends). I've been playing around with Facebook Analytics since it came out and it's powerful! You can build audience cohorts, retention models, and revenue funnels with a few clicks. Have I stopped using Google Analytics? No. But I'm definitely in Facebook Analytics a lot more learning how people are interacting with our content, our Page, Messenger bot, and more. Be sure to checkout The PPC Show episode Understanding Facebook Analytics: Breaking Down the Core Features to deeper dive into the core features. Facebook Analytics allows you to measure, understand, and optimize the interactions people have with your business across both devices and channels to help drive meaningful growth. With over 2 billion people on Facebook, our analytics solution provides rich, unique audience insights, powerful reports like conversion funnels and retention curves, and automated insights. Facebook is directly tying activity on it's properties to actual business revenue. This is huge for marketers. Your marketing goals shouldn't be tied to single channels anymore, because people interact with your business across channels like your website, Facebook Page, Twitter, email campaigns, and in-store visits. Understanding how those interactions happen is key to creating the right user experiences, measuring omni-channel performance, and scaling growth across your marketing campaigns. Here are five areas where Facebook Analytics is better than Google Analytics. Google Analytics is great at tracking devices, but not necessarily the person behind them. For example, when I visit a website on my phone and again on my desktop computer, Google Analytics sees me as two different users. That's a tough pill to swallow for companies running a lot of social media companies. Why? Because mobile ads accounted for 89% of Facebook's ad revenue during Q4'17. In other words, the vast majority of traffic coming from Facebook is on a mobile device. And for most companies, people still convert on desktop. Thus, making it difficult to track Facebook campaign attribution in Google Analytics. In contrast, Facebook Analytics is able to stitch together who you are by using your Facebook login and enriching your profile with activities from other third-party data. More importantly, Facebook Analytics focuses on people, rather than cookies, sessions, or devices. This allows marketers to understand when the same person interacts with their business across different channels and devices. Marketers can now easily measure and unify people’s behavior without any additional work or hassle, such as manually assigning and mapping user IDs in data warehouses. Funnels - Funnels allow you to monitor people's journey's through your experiences - whether that's an e-commerce checkout experience, registration or sign up process, or how far people make it through your New User Experience (NUX). Funnels are the best way to identify where you should spend your resources and optimize your app. Cohorts - After acquisition, retention is the other half of the growth equation. Cohorts are the way to understand how well you're retaining your users and, more importantly, how changes to your app are affecting that retention. With Facebook Analytics behavioral cohorts, we can even look at how changes to your app affect Lifetime Value (LTV) or any other event you care about. Segments - To really understand your users you need to zoom and understand different audiences. Whether that's seeing the demographics of your top performing customers by value or seeing how well a particular demographic converts in your funnels (segmentation is supported on most reports in Facebook Analytics). For example, a university could build a funnel to measure the amount of people who commented on a particular Page post and then requested degree information on their website. Tracking Facebook Page activity to website leads/purchases should have marketers saying, "giddy up." A newer feature in Facebook Analytics is the ability to unify your website, app, Page, Messenger, and more into one global view. ESGs are two or more of your event sources (like Messenger, website, your mobile app, or your Facebook Page) grouped and given a name. ESGs have their own dashboard in Facebook Analytics, and let you see user behavior and interactions across the sources you group together. Marketers can now aggregate, measure, and visualize people's actions across both devices and channels, including your website, app, Facebook Page, and offline events to optimize campaign conversions and even retention. They're calling this omni-channel analytics as it spans across Facebook's family of apps and services with the addition of your website, bot, and offline events. Seamlessly create custom audiences from your apps, websites, and bots, and target them with Facebook ad campaigns. This is really cool and something I haven't heard many paid social people talking about. Think about all the ways you can organize your custom audience groupings for deeper user segmentation. Again in Google Analytics, you can create very advanced audience segments, but you're really limited to only website visitors by device. We can't combine other Google properties and apps like Gmail and Maps into one holistic view. This is why this feature is powerful for marketers to understand and utilize to drive the right messages at the right time. 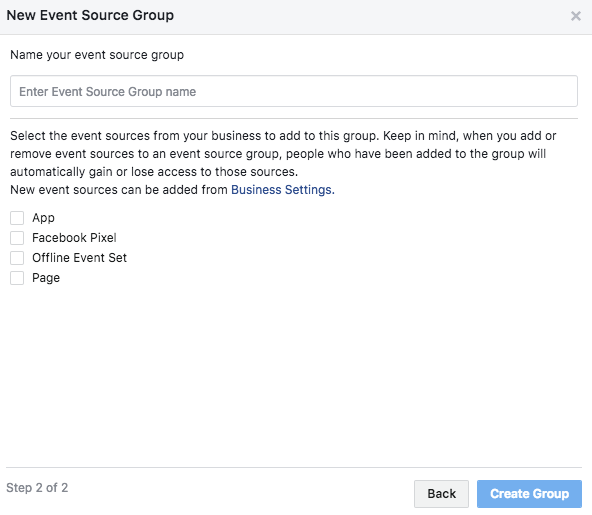 Keep in mind that you can't create a custom audience if your Facebook Page is included in your Event Source Group. You'll have to create Page audiences using the Audiences tab in Ads Manager. Using advanced machine learning, Facebook Analytics reduces the time spent searching for clues by bringing valuable insights directly to you. Facebook Analytics Automated Insights surfaces valuable data and trends to help you focus your efforts and keep your business moving forward. This is similar to the Google AdWords opportunities tab where they're surfacing insights quickly and easily for marketers to understand audience performance. They breakout insights by device, age, location, and more. Pretty cool to see these granular user trends going up and down as it's not something we usually think about. By closing the loop between your online and offline channels, you won't have to wonder if people browsing items on your website or commenting on a Facebook Page post translates into sales in your store. Be sure to also check out the Complete Guide to Facebook Analytics for more information. And be sure to like their Facebook page and follow them on Twitter for the latest updates. Go check out what Facebook Analytics has to offer and let me know what you think!